Outreach is a vital component of any archive or library service’s strategy, and this applies as much to digital archives created via digitisation as it does to physical ones. To us, the term broadly means carrying out a wide range of promotional activities to inform a potential user or visitor about your archive. Typical benefits include increased awareness, a rise in footfall, a rise in website traffic, and more; which can in turn help towards revenue generation. But with increased workloads and budget cuts, making decisions in terms of an archive’s outreach strategy – not to mention researching potential techniques – may not be top of your list of priorities. “Alongside our other outreach tools, we regularly write blog posts to showcase the many different sides of our digital archive – they are key to engaging with interested parties. We write a wide range of informative posts from unusual images and documents we’ve found to event announcements and industry news. To keep our readers interested, the posts are written by a variety of people working on different elements of the collection. We also like to include profiles of staff and volunteers to show the work we do and to encourage more volunteers to join us. Members of the public also have the opportunity to submit topics they think may be of interest. Although a more time consuming way of informing potential users about your archive, the end benefits are worthwhile. Via their blog The Mills Archive are able to write about topics that interest potential users and promote previously unseen materials in more detail than is possible with other outreach methods. “As our collection features geographically specific images, we decided to approach The Liverpool Echo. We worked closely with them on the article to ensure all information was correct, especially how to access the archive. To reach a larger audience we also sent out press releases – including project details and key quotes – to other local media outlets, such as The Southport Visitor. Press releases are an excellent way to supply all the information the press need to put together a news item, concisely and in an easy to read format. As the collection is hosted online it can be accessed worldwide, wider press coverage is welcomed. Our archive has been featured in the national Who Do You Think You Are magazine several times, which has helped to raise awareness enormously. Again we worked closely with the WDYTYA journalists, providing input where required. This approach has been a very cost effective way for Sefton Council Library & Local Studies to promote the collection, both locally and nationally. The majority of the press coverage was planned to coincide with the launch of the archive and Sefton continue to work with the press to promote the collection, whilst utilising other outreach channels. With an ever increasing number of archive users being active on social media, these platforms can be great tools to raise awareness amongst, and engage with, your target audience on a more personal level. 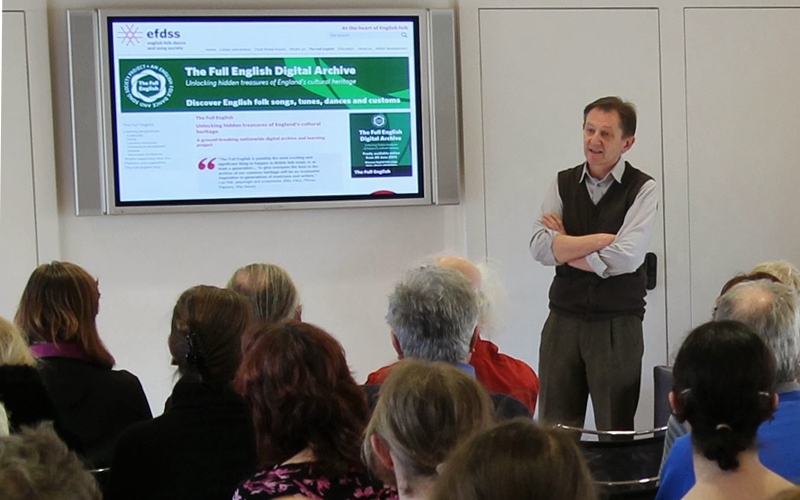 “After a successful launch event, we wanted to continue to promote the digital archive using inexpensive and easy methods. By having a Facebook page we have been able to achieve this. It does require time and commitment, but the result has been worthwhile. To date we have over 2000 likes and our initial launch post reached over 16,000 people- all potential users. Also we receive over 300 visitors to the online archive per month from Facebook alone, so the benefits are clear. The page is used to show interesting archive material, as well as advertising and raising awareness of upcoming events. We also encourage a two way dialogue and engage with our audience by replying to comments and enquiries as often as possible. Facebook has proved invaluable to Herefordshire History and has allowed the archive to build up a relationship with current and potential users. This has helped raise awareness and increased website traffic. Social media is a vital outreach channel that anyone can use. “As well as celebrating what we had achieved, the primary aim of the launch event was to showcase the new digital archive to interested parties and demonstrate the website – encouraging the public to explore the collection. Before the official launch, we also held other events and worked with other parties to educate more people about the project. These included family history events, heritage open days and themed talks about various aspects of WW1. We also partnered with Reading University for one event. Organised by history students, members of the public were encouraged to bring along items of importance related to Berkshire in WW1 to share with a team of experts. One off events are vital and can be very beneficial – helping boost engagement and raising awareness, but there are of course time and cost implications. These can be reduced by linking up with similar organisations, like Berkshire Stories did, especially as larger events with multiple partners mean a wider audience engaging with an archive. Whilst all of the channels above can be very effective, it’s worth noting that an outreach strategy employing a mix of complimentary channels will deliver the best results. Such as using social media to share interesting blog posts, or using events to promote your blog and social media pages. Finding the right mix for you, which offers benefits whilst being sustainable with your available resources, is key. Found this article interesting and would like more advice on outreach and promoting your archive? You might find our Marketing Consultancy page useful. Or alternatively you can contact us.